Hi everyone. A while ago I had a day where I tried out the Floating Alcohol Inks technique. I made lots of different combinations of colours, using leftover pieces of glossy card stock. Click HERE to see a card I posted earlier using one of those backgrounds. This technique produces a marbled look --- very cool! Fast forward 9 months later ... I still have a big stash of these backgrounds. Just so happens that my good friend, Karen is running a challenge on Splitcoaststampers using this fun technique. Here's a link to Karen's Floating Alcohol Ink card. Since I used a snippet of glossy to make my background, I'm heading over to Snippets Playground for some fun! And dropping in to play at Simon Says Wednesday where Anything Goes this week. what a great guy card - must get the alcohol inks out and have a go at this! You make me want to go through my stash for colorful backgrounds and try something like this! Fantastic idea for them and fast too! A great masculine card using theses techniques, Loll! Very nice masculine card, Loll. You are always using different techniques. I know what you mean by using up some of the stash. I look through it once in a while. Does that count? Haven't braved the world of Alcohol Inks as yet. Only just getting my feet wet on Brusho's and Water Colours! Oh, your alcohol ink panel looks great, Loll - love the clocks and the colours - yeah for using some of the stash, hey - I don't really own a lot of alcohol inks, but I think I should give this technique a try!!!!! What a lovely masculine card card you created!!! This is a very cool technique, Loll. How smart of you to have a stash of these panels. Gorgeous Loll and yet another technique I want to try!!! 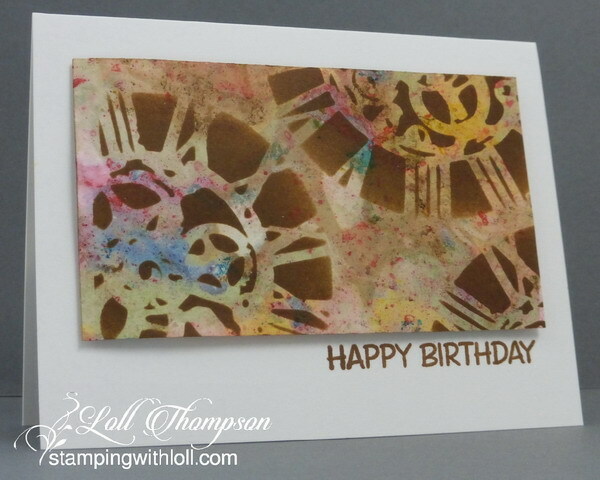 Your background looks great with the stenciled clock on top of it - a fabulous masculine card! Such a cool technique!! I will definitely have to give this a try! That looks so cool. Really has you looking at it and wondering "how'd she do that?". Glad I know now. giggle....thanks so very much for the nod mf!! You rock! I giggled because we really need to get together. I have sooooo many bkg. pieces in my stash that I need to find a use for. I make them and then don't know what I want to do with them. I really like how this card turned out. The stencil over the hints of colour looks really great. I was just telling Karen I need to have a Karen technique day and I should include you in that, Loll. You have so many unique ideas for using the techniques and this is a prime example.